HCC performed the demolition of existing walls and MEP facility systems for the new project. Asbestos tile and mastic flooring had to be removed. HCC infilled existing drainage trenches and coated the floor with a new chemical resistant coating. Hodess erected a new steel platform, above the existing roof, in order to support the new air handling unit, future air handling units (future expansion) and exhaust fans. 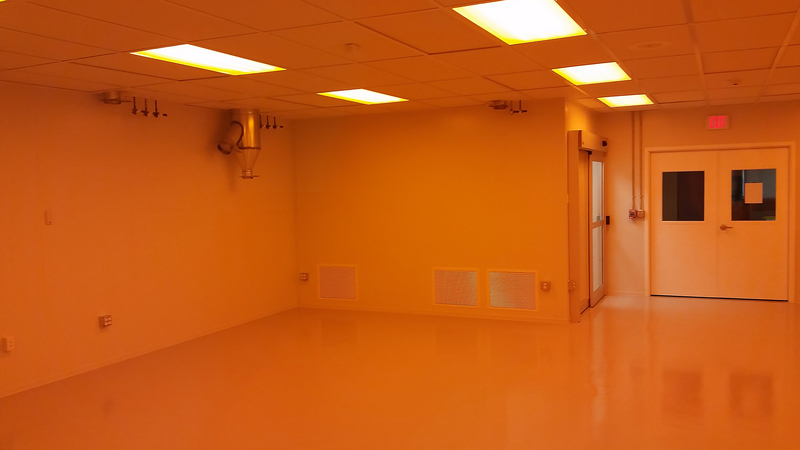 We constructed the new ISO Class 7 cleanroom for the owner’s Sputter and Lithography Labs, ISO Class 8 gowning room, and 2” and 4” IMP walls, plenum cap, and Gordon LG-15 ceiling grid. HVAC system included a new 9,600 cfm roof top unit, humidifier, and reheat coils. New electrical included a new breaker and switch gear as well as replacement and new distribution panels to meet code, and feed new tools and equipment. Process systems including nitrogen, argon, compressed air, and process cooling water to facilitate new tools and equipment were also part of this installation.